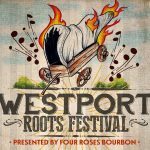 Music Festivals 2018: The Westport Roots Festival. Unites​ ​performers​ ​and​ ​fans​ ​of​ ​roots​ ​influenced​ ​music​ ​in​ ​Kansas​ ​City’s historic​ ​Westport​ ​neighborhood.​ ​ ​From​ ​Bluegrass​ ​to​ ​Southern​ ​Metal,​ ​Honky​ ​Tonk​ ​to​ ​Folk,​ ​this music​ ​festival​ ​offers​ ​a​ ​unique​ ​lineup​ ​in​ ​an​ urban​ ​setting.​ ​Enjoy​ ​65​ ​acts​ ​on​ ​2​ ​stages​ ​Memorial​ ​Day weekend,​ ​May​ ​25th​ ​through​ ​27th,​ ​2018. Westport Roots Festival is back and better than ever. Located in the heart of the historic Westport Neighborhood and now in it’s 5th year, Westport Roots will showcase 65 bands on 2 stages over Memorial Day Weekend. It all kicks off with the official Pre-Party at Westport Saloon Friday, May 25th. Saturday and Sunday, we kick things into high gear with 2 stages, both within a stones throw of one another. Best of all, you will be able to see each and every band and take your Four Roses Bourbon with you as you bounce from stage to stage with your friends. Bluegrass, Honky-Tonk, Rock and Roll, and everything in between! Please Keep in mind, The Friday Night Pre-Party is held at The Westport Saloon and is only a 200 person venue. A seperate Pre-party ticket is required for this night. Can kids come to this event?Unfortunately no, this is a 21 and over event. Where do we stay?AC Hotel is the official sponsor. There are several hotels in the immediate Westport area, but be sure to book in advance! Where do I check in?Tickets, and Will-Call, will be located at the East entrance of The Westport Saloon for the pre-party on Friday, May 25th. Saturday and Sunday the Will-Call tickets, and check in, will be at the North entrance of The Westport Saloon. Can I buy tickets the day of?Yes. Visit us at the Will-Call and ticket booths. It will be $10 more. Can I pay to just visit one stage?No. No you cannot. Where can I find an exact schedule?A working schedule is posted on the website, however set times are subject to change. There will be an exact downloadable/screenshot version available before the Festival and printed copies at the ticket booth. What time does the music start?Music starts at 7pm Friday, May 25th, Noon on Saturday, May 26th, and Noon on Sunday, May 27th. Does my ticket guarantee that I can see every show?Not in entirety, but yes. You can get to see every band this year. We have slimmed down our stages to three, all within a stones throw from each other. Where do we eat?Westport is home to many delicious restaurants. Visit http://westportkcmo.com/. If you are looking for 24-hour/late night food, we suggest Town Topic or Chubby’s on Broadway. If you are looking for the best BBQ in town, try Arthur Bryant’s or Slaps. There are just so many little nook and crannies to eat at I still find new places each year I go to this one. And as always I will be researching this festival immensely and adding any I find, and after going in person for the year I’ll find even more. I FULLY intend on helping them grow through a multiple area media campaign I will introduce to you here. I have talked with the owner of the Westport Saloon and he told me the AC Mariott sponsors this event and offers reduced rates to the attendees. Keep your eye on www.WestportRoots.com as we announce lots of special party hosts, add-ons, special guests and more sponsors! 80 acts for $40 if you buy now. $50 at the gate. This festival is cheap because of our CORPORATE SPONSORS! We’ve gone out of our way to find companies that support live music and are relevant to your interests! Drink Four Roses Bourbon, Beer from Lagunitas Brewing Co and wine from Barefoot Wine & Bubbly! These guys truly support independent roots music without question. And don’t forget WRF is Ameripolitan Music Official approved!